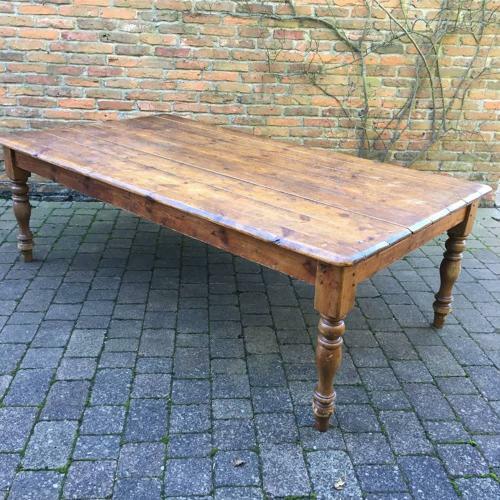 Very large Victorian Pine Table...will seat 12 but 10 comfortably. As it is wide you can sit two at each end and four down each side. It has a fantastic warm, yew like colour. It has early pegged construction. The feet have been tipped at some point in its long life and therefore it is the perfect height (many Victorian tables are too low for us larger/bigger people today). The length is 89.5" & the width is 49.5". The height is 29.5" and the leg height from the floor is 23.5"
There is no worm but few marks, knocks as expected. Will have to be collected or sent by courier £85 UK.